The deep freeze is in full bloom on the east coast. But this is a good season for us, the harness gods of winter can be kind, as they were again the past weekend. Kindness from the horse spirits does not propel our horses to victory, it allows the general public to dismiss our picks, so that the strong contenders we suggest can win at terrific odds, valued far more than the horses’ chances. Certainly the Peter Lobell Final at Cal Expo on Friday, Jan. 21, was a major example of seeing value explode. In a five-horse field, we trusted Art Of Arts to win and hoped for a price of 3-1. To our advantage, “Arts” went off at $9.50 to the dollar, a remarkable offering. He won and paid $21. Consider that the win price was only a few cents short of the exacta ($21.70) and you have another reason to trust in win wagering. If you thought 5-2 were worthy odds for Gerrie Madison on Friday at the Meadowlands you were rewarded with a $7.60 price. It was a chalk-filled night in the winners’ circle that evening, so perhaps 5-2 suit you well. Saturday, Jan. 22, our focus on the Willowbrook Final at Woodbine rested upon the closing odds and your discretion of value. We wrote that Art Professor could be an overlay but he was bet down sufficiently for us to look at the other horse we mentioned, Twin B Warrior. At 5-1, this one was the bet. He won and paid $12.30. Sometimes these tightly contested races are worthy of attention. What happened in the Willowbrook was a lot like what happened in the Peter Lobell. The public tends to concentrate on a single contender, resulting in a favorite that does not deserve the heavy backing. This imbalance is so common in harness races; it is our bread-and-butter betting move that keeps us in the black. We apologize for listing the incorrect races for Saturday’s non-takeout Pick 4 at Cal Expo. At press time we could not reach the Cal Expo race office to confirm which quartet of races on the card made up the wager, considering there were only 13 races that evening. We went with the Pick 4 as the final four races, when in fact it began with Race 9. However, the evening was far from a bust. One of the choices in our small ticket was Jet Tet Tet in Race 11. He won and paid $16.40. We nailed what we thought was the final leg of the Pick 4, Race 13, with Sandra Hotspur. She won at $11.20. We suggested you use My Real Love in Race 10 but didn’t care for an even-money price, as it turned out. Still, it was the second leg winner at $4. Speaking of bad prices, at the Meadowlands on Saturday in a division of the Presidential, a dead heat destroyed the price of Bettor Sweet as his nose was directly beside the nose of Alexie Mattosie. The win price was $2.10. Our other “Prexy” contender, Mr Saratoga, finished sixth, while our Complex contenders, Windsong Gorgeous and Ise The Big Boy, finished second and fourth (disqualified and placed seventh), respectively. At Pompano, Reve Pride and Dragon’s Blood finished second and Monet CC was eighth. Pompano has added a Pick 3 on the final races of each card, beginning Jan. 24. Before this there was only one multi-race exotic available, a Pick 4. Post time at Pompano Park is 7:05, EST, every Monday, Tuesday, Wednesday and Saturday. 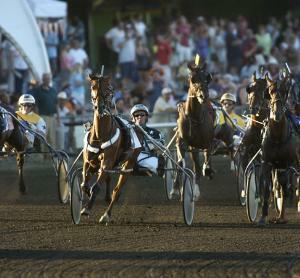 The Presidential, Complex and Clyde Hirt finals are the Meadowlands’ top events next weekend. The Prexy could develop into a fine betting race with many strong contenders, as well as this is the season for quick-developing accomplishments. Three-year-old colt pacers, only recently freshmen, take their sulkies around the frozen tundra of Woodbine in the Count B Series opener next week. We have to keep our eyes on the young guns this early in the year. Before long the new divisions will be in full force and the Grand Circuit will host any number of very valuable wagers as the ice melts.